Characters talk| Meet the brand story of a modern car. Nice to meet you! I am a car and my name is Blue will. I bet you must be curious about me. Let&apos;s find out everything about me as well as SSINGSSINGEE who was actively working before I was born! The longer I travel with eco-friendly energy, the more the environment can be purified! I would like to introduce my friends living with me in the Vroom land! Honk! My name is PINKO! 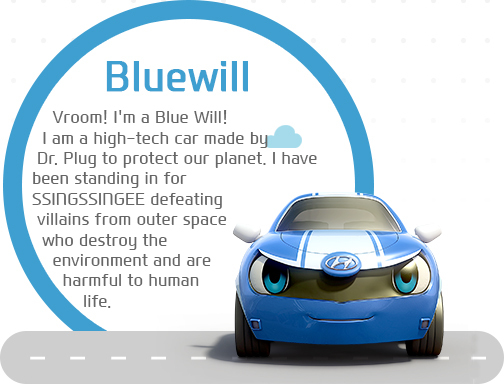 I am a high-tech car created along with Bluewill by Dr. Plug. I have a special ability. I can fly in the sky using wind energy. Hi, my name is ACCEL! Everyone thinks I&apos;m a naughty boy. But, I want to become a world skateboarding champion when I grow up. My dad, Dr. Plug, is working for Hyundai Motor Company and making eco-friendly cars. 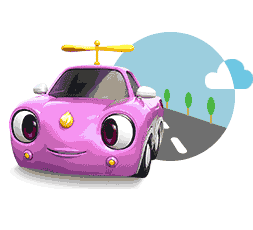 Today, I am going to sneak into my dad&apos;s laboratory and see his eco-friendly cars with my friend RADI. Do you want to come with us? Pleased to meet you! I am RADI. 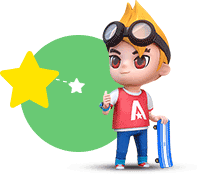 I like my friend ACCEL because he is good and strong-minded even though sometime he is somewhat off-the-wall and mischievous. I&apos;m very excited to visit Dr. Plug&apos;s laboratory with ACCEL. 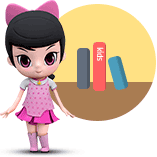 I&apos;m a smart girl dreaming of becoming a great scientist like Dr. Plug! In Korean, the sound of the wind "Ssingssing" + "Chal dallinda" meaning to run well = "SSINGSSINGEE"
Can transform into a robot when necessary, and teach a lesson to baddies who always cause trouble! Live a good and healthy life by helping others! Has a strong sense of justice, friendly and outgoing with a lot of friends. I was born a 2D character. Cute, wasn&apos;t I? At that time, I had a function to transform into a flying vehicle! I was upgraded to a 3D character in 2003 and given telematics functionality. How cool do I look? Here we go! This is my latest look from my last upgrade. 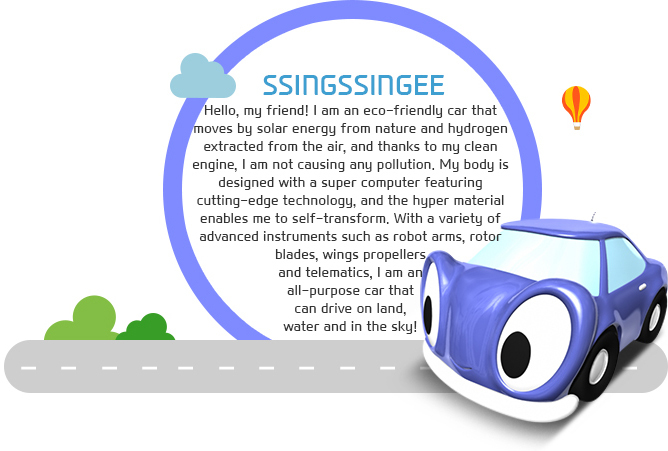 I was reborn as a new SSINGSSINGEE with the very polished look of a shiny automobile!